For such a small county Bedfordshire is very rich in habitats due to its underlying geology, overlying soils and river systems. This also means however that much of it is fragmented into small vulnerable pieces. We have done a considerable amount of mapping of these habitats, as well as some of those that don't make the grade as Priority Habitats, but this work isn't yet complete, and because they are also continuously changing, they will need constant (or periodic) maintenance. Of course it is impossible to fully map habitats, as it dependends upon how closely you look, and your perspective. To a Cladonia lichen for example it may be the space between two heather plants that it considers as suitable habitat, whereas a solitary wasp which only nests in bare ground will prefer the patch of sand a few metres away. When we look at a broad scale we may simply classify the whole area as being Lowland Heathland, but a detailed survey of a site will identify patches of acid grassland, heather, bare ground, gorse scrub, birch trees, etc. Some sites, especially County Wildlife Sites, may have been NVC surveyed, but other land may have only been Phase 1 surveyed. The whole county was Phase 1 surveyed in 1987-88, but this is not available in digital format, other than as scans of the pencilled maps. So we are likely to end up maintaining data which contain a patchwork of resolutions according to the level of detail in survey work, and also a patchwork of ages, depending upon when surveys were performed. The map below therefore represents a snapshot of a continuous work in progress. 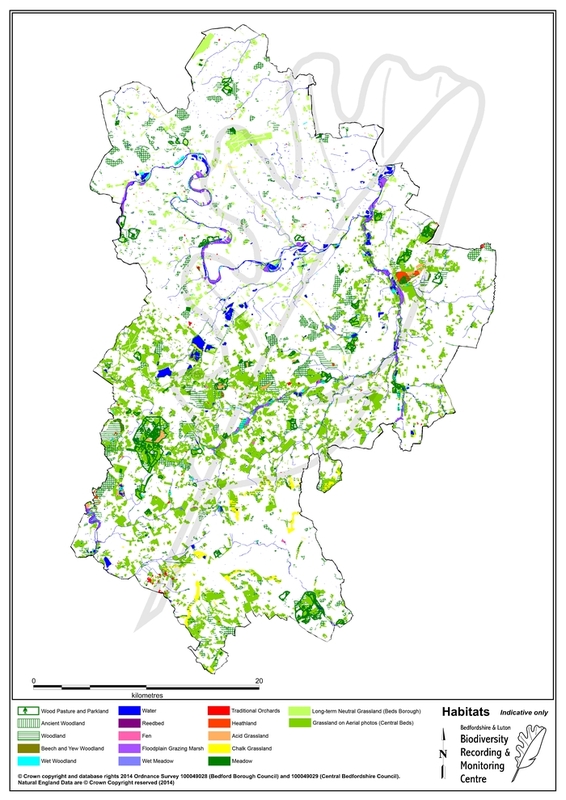 You will notice apparent differences in grassland cover between Bedford Borough and Central Bedfordshire, but this is only because of the different mapping approaches employed. In the case of Central Bedfordshire everything that appeared to be grassland on aerial photos was mapped, but for Bedford Borough it was only grassland on modern aerial photos that had previously been semi-improved neutral grassland in the 1987-88 Phase 1 survey that was mapped. For Luton Borough little mapping has been done to date, though this is now changing. If you are interested in obtaining habitat data you will therefore need to discuss with us what is available. We still have a lot of inherited survey data only in paper format, though much of this is progressively being scanned if not digitized.